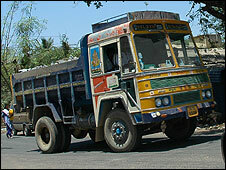 Rajesh Ghogare has been driving trucks for 17 years. Every month he sends money home to his village for his wife and three children. But over the past few months, life has got tougher. Some of the trucking companies have cut wages, making it harder to make ends meet. "Earlier on, the work was good," he says. "We'd get more money as the truck owners were earning lots. "But now they're suffering, we don't know if we'll lose our jobs and the wages are falling. Many drivers have started looking for other jobs." When times are good, companies need plenty of trucks to get their produce to market. But when economies slow, truckers are the first to feel the impact. 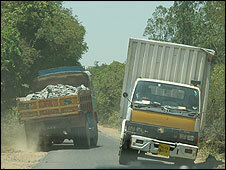 And while India's economy is still growing at more than 8% a year, many small truck operators are feeling squeezed. Expansion plans have been put on hold. Some have begun selling off their trucks and hiring them in when needed. Many have shifted to using smaller, more flexible vehicles. "If interest rates go any higher, if diesel prices go any higher, we'll start going backwards," says Purshottam Thakkar, the owner of Yogeshwar Road Lines. He runs a fleet of three lorries, which are mainly used for bringing grains and pulses from around the country into Mumbai. Over the past year he has been forced to lower his ambitions. He would like to expand, but simply cannot afford to. The high interest rate on loans means investing in new trucks is expensive. Fuel prices rose at the start of the year, eating into profits. And he is not feeling confident about the future. "Of course I'll be affected, because I can't afford to buy new trucks," he says. "I'll have to start selling off the old ones, and because of that automatically business will go down." This feeling of gloom is felt across many parts of industry. High interest rates have been choking off consumer demand, particularly for large, expensive goods like bikes and cars. The latest survey from the Confederation of Indian Industry shows business confidence has fallen about 9% compared with the previous six months. All the more surprising, then, that the companies that make trucks are rapidly expanding their production here. A string of international firms have set up joint ventures to get into the Indian market. Last week Volvo and Nissan both announced new subsidiaries, in partnership with Eicher Motors and Ashok Leyland respectively. Not to be left out, local companies such as Tata Motors have announced ambitious expansion plans of their own. In all, the industry is spending more than $3bn (£1.5bn) over the next two years to increase production and raise capacity. "You have to take some long term decisions," says Tata's head of commercial vehicles, Prakash Telang. "While there are some corrections happening in the marketplace in the short run, we're quite buoyant about the long-term view of the country. "We want to have our capacities ready when the market wants it." He points to the rising need for transport as the cities grow, and at the substantial government investment aimed improving the roads around the country. Tata also has its eye on the overseas market. It wants to turn India into a production hub, providing trucks for developing economies from Russia and Africa to South East Asia. But when will demand in India itself start to pick up again? "It's difficult to answer this question," says Prakash Telang, "but it's not going to be soon." That is an uncomfortable meessage for those back at the freight companies. The owners are waiting to see if fuel prices rise further before deciding what to do next. Small companies may be forced to sell off more of their vehicles. For drivers like Mr Ghogare, there is little option but to wait and see what they decide. At the moment, there is still work to be found, often driving smaller vehicles. With luck, that will be enough to keep them on the road, until the economy booms once more.